Forget boring old whale watching cruises! You'll be taken on an exciting and unforgettable journey to see the Whales in their natural habitat on a safari style open ocean RIB. SPECIAL OFFER! AVAILABLE 7 DAYS. Forget overcrowded, slow and seasickness-inducing whale watching ferries with 150 other passengers - and put the FUN back into whale watching! Due to the open design and low position in the water, we offer the only unobstructed and up-close viewing position. You'll be taken on an exciting and unforgettable journey to see the Whales in their natural habitat on a sturdy and stable ocean RIB (Rigid Inflatable Boat). Fun crew - this is a personal experience! 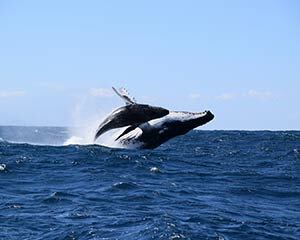 Your whale watching safari tour starts with a leisurely cruise through Sydney Harbour before turning up the power and blasting towards the open ocean. After passing through the heads you're taken at a brisk pace to see the whales - your skipper is in constant contact with other boat drivers to find the most friendly and approachable whale pods. Whale sighting guarantee - if whales are not spotted, each passenger will be issued with a 'Standby Ticket' for another Whale Watching tour during the same whale watching season. 'Standby tickets' are eligible for redemption no greater than 24 hours prior to the requested departure subject to availability. There will be other passengers on the boat with you.